Even thou Dungeon Keeper is a great game, it has some obvious flaws. So I want to start this topic to help Dwelvers from making the same mistakes. - I love the whole digging / building rooms part. - The creatures personalities (But I think they should have been improved a little bit). - Being a Dark Overlord. - The humour the game brings to the player. - The battles, they can be fun, but aren't that challenging for the player. - That takes me to the creature hand dumping, it is great for commanding imps, but when it comes to just dumping creatures on the battlefield, it makes the game a little bit to easy. - The torture chamber was fun. But way to easy to use, as soon as a enemy entered my dungeon I could just convert him, and very soon I had an invincible army. I agree with Stabicus on strengthening up the dungeon walls. It's frustrating to go through all this trouble to build traps and a killer dungeon layout only to have the invaders dig right past all that and straight into or near your dungeon hart. What I'd like to see are randomly placed surface entrances that the heros have to enter though, and that you have to eventually connect to if you want to keep getting the resources you need to keep building new monsters. With the connecting to and raiding from the surface being what attracts the heroes to enter your dungeon, some looking for loot, others to gain status by slaying powerful monsters, and still others, to rid their realm of evil. The motivations will influence where the invaders will go. Looters would be looking for the first storeroom they can find with something valuable and interesting to them, and once they find it will grab whatever they can carry and head for the exit. Status-hunters will leave with proof of their heroism once they have slain a sufficiently powerful monster and taken their trophy, while the do-gooders and evil rivals will be after the dark mother, and shutting you down, permanently. I also agree with bfq about the walls, and being able to undo something if you find you don't like it or hit something by mistake. I believe dirt is kept as a resource, so why not be able to spend it on re-building a dirt wall if you need one somewhere. Another thing that can screw up a dungeon layout is having a wall with an ore seam in it, if it's in an inconvenient location, it can mess up a room and if you order an imp to dig it out so you can get access to the ore you lose the wall, and can't get a new one. Being able to dig the ore out, then have an imp put the dirt back in place as a normal wall would be very helpful. As would being able to upgrade walls to be stronger then dirt. If you have a rival keeper then he can also upgrade his walls, so you would need to make stronger/specialized creatures or tools to dig through them. This could make some levels much more challenging then they might otherwise be, without having to just resort to bigger and bigger hordes. I have actually gotten a lot of request about being able to rebuild the walls. So this have been implemented into the next version (or just added to the build menu, the imps will do the work of rebuilding them in later versions). So I totally agree with this. I got so annoyed in DK when I accidentally destroyed a wall, or when a vein was in the way.. I have thought a long time about the walls, I could spend a lot of time on building various traps and then the enemy just walk right through them by digging his own path, I didn't feel like that was okey... But haven't been able to come up with a good idea on how to fix this problem yet You have some good ideas there BFQ, hopefully rebuilding and reinforcement of walls will do the trick, but I don't want the player to just be able to barricade himself so that no one can reach him for hours. But then again, it is never a good idea in a strategy game to barricade to early, because then the enemy can gather resources in peace and do a devastating attack when needed. Having hidden areas with powerful monsters and great rewards is a must Mini bosses with their own generated dungeons filled with traps, the gameplay for that alone would be enough to have scenarios without any actual enemy keepers, would be fun to play in co-op too Just a challenge for the player/s to get the treasure before the time is up..
How about my idea of having different invaders having different goals? So not all parties of heroes are exactly goodie-goodies just out to rid the world of evil. Some are, but others will be after different things, so you have to spread your defenses out to guard many different areas then just your dark mother, and if you over-expand you can easily find your defenses spread too thin, and end up with some part of your dungeon vulnerable to attack, so you have to balance growth with defense. I'd also like to see specialized creatures and tools that creatures can be equipped with that can serve as a counter to upgrading wall and barricading yourself in. If you try to barricade yourself, your enemies will adapt and come back with or bring in specialists to get through your walls, unless there is a path to take, in which case they will follow your dungeon paths, rather then waiting for a specialist at tunneling through whatever types of walls you have used, thus making your dungeon layout meaningful. Also, how about exits to the surface? 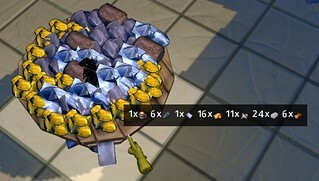 This could be something that the player is eventually required to connect to in order to get resources (by raiding the surface dwellers) which is what attracts their attention to start attacking/raiding/looting your dungeon. But I like the idea with creatures having different goals, so that the game don't get to straight forward. Balancing growth with defence is a good goal, and hopefully it will be enough to kill of those that prefer to barricade themselves, because then the growth will suffer while the enemies will roam freely. And if the enemy can focus on just attacking and expanding his territory then the player that barricaded himself will get killed rather quickly..
My Idea of surface exits was more of that's where attacking surface dwellers will come from and attempt to escape to when they're done in your dungeon. Your creatures going there would just mean they dissapear from the map for a while and when they return they have some random loot to take back to a storage room, and have a random chance of getting hurt, killed or followed back by a party of heroes on their raids. But like I said, if that doesn't fit with the game as it's going now, I fully understand that. Rasmus Wrote: Balancing growth with defence is a good goal, and hopefully it will be enough to kill of those that prefer to barricade themselves, because then the growth will suffer while the enemies will roam freely. And if the enemy can focus on just attacking and expanding his territory then the player that barricaded himself will get killed rather quickly..
A possible solution to replacing sections that have been dug out is to include concrete in the game. To make the needed cement a player would be required to build a Kiln room near lava. To make concrete a mixer would need to be constructed and move to the new wall location. The workers would mix the cement and create a new wall, the mixer being incased in the wall in the building process and forever lost. The concrete section could be harder to dig out restricting enemy unit’s movement but would be expensive and time consuming to build. I like your idea, but atm we are able to build up walls just like any other building. I prefer it that way because it is fast and simple to do, implementing your idea would require a lot of time-consuming work by the player, and building up walls should be as easy as digging them out because it is such a fundamental part of the game. What I am a little annoyed about at the moment is that if an imp have built the wall there is always a chance that he will end up on the wrong side of it once it is finished. And there is no way for the computer to actually know what side the of the wall the player wants the imp to end up on..
Couldn't it just be set so that the Imp would always pop out on the claimed territory, or have it not be instantaneous like it is now to build a wall but instead place a build object so the Imp can move out of the way? What if, when we get that construction scaffolding box thing while something is being constructed, we can right-click (Or left-click; whatever.) on it, and a little green flag or something would pop up on one of its sides, and repeating that click will switch that flag in a clockwise manner around that block to indicate which side the imp should pop out on. If the computer thinks it can't get the imp out on that side, the flag will be red. Current time: 25-04-2019, 08:41 AM Powered By MyBB, © 2002-2019 MyBB Group.